It’s the Wadsworth’s biggest night of the year coming March 12. Newnan’s own Courtenay Budd returns as artistic director and host for the 2016 Friends of Wadsworth concert, a continuation of the series that has brought international talent from the classical music world to the Wadsworth Auditorium stage. Begun by the grand hall’s namesake Charles Wadsworth, the chamber music programs have brought packed houses for more than two decades. 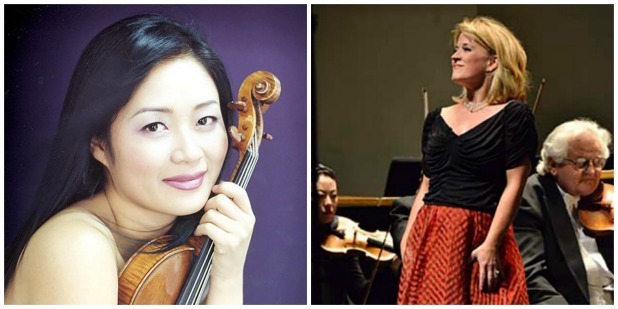 This spring there will be familiar faces in soprano Budd and violinist Chee-Yun. Joining them will be Randall Scarlata, baritone; Nokuthula Ngwenyama, viola; Wendy Sutter, cello; and Laura Ward, piano. They are preparing a program of pieces from Beethoven, Brahms, Vaughan-Williams, Handel and Bach. Organized under the auspices of the Newnan Cultural Arts Commission since 2007, the concerts originally led by Charles Wadsworth for many years served as benefits to help fund the Newnan municipal auditorium’s restoration. In gratitude, the City of Newnan named the hall in his honor. Wadsworth himself says the restored hall has some of the best acoustics he has encountered in his travels. Wadsworth grew up on Jefferson Street in a home next door to the art deco-style auditorium. After developing his skills at the piano he had a long career directing the chamber music program at Lincoln Center in New York City and created programs for the Festival of Two Worlds in Spoleto, Italy, and at the Spoleto USA music festival in Charleston, SC. Having performed and rubbed elbows with artists all over the world, Wadsworth was able to bring a long list of up-and-coming classical music talent to his hometown. Talented violinist Chee-Yun was among the early performers in the Wadsworth and Friends chamber music concerts and has returned numerous times over the years. Now friend, colleague and fellow Newnanite Courtenay Budd is continuing the tradition. Last fall she expanded the Wadsworth’s musical offerings, bringing a Rags to Riches program which included Warren Martin’s comic oratorio “The True Story of Cinderella” — a piece she remembers fondly from her graduate music studies days at Westminster Choir College as it was performed by faculty for incoming students. Ms. Budd now dives into her third season continuing Charles Wadsworth’s legacy in her hometown. A graduate of Newnan High School and a “Distinguished Young Alumnus” of the University of the South, she holds a master’s degree from Westminster Choir College and resides with her family in New York’s Hudson Valley. Recent highlights include a recording with composer David Del Tredici, recitals in Italy, orchestral concerts, and teaching for the Young People’s Chorus of New York City. A Young Concert Artists alumna, Budd has performed with the Chamber Music Society of Lincoln Center, the National Symphony, Santa Fe Chamber Music Festival, Carnegie Hall and the Grand Teton, Bard, and Spoleto USA Festivals. Her lullaby CD “Sleep is Behind the Door” was named “Lullaby Album of the Year” by CDBaby.com and has raised thousands for victims of natural disasters. Kim Wright of the Newnan Cultural Arts Commission is chair for this year’s Friends of Wadsworth concert. Tickets will be going on sale soon at outlets around Newnan. Watch www.cityofnewnan.org and the Newnan Cultural Arts Commission Facebook page for details.